I agree! I am aware this is not everyone's favourite episode though (with Larchlap Riley's "Miracle" story somewhat implausible), but the character of Larchy is quite funny - a true rogue who owes absolutely EVERYONE with a family who are loyal to the end. The female writer of this one was clearly trying to involve a domestic violence theme here, which had already been covered to some extent in "Not A Bad Lad, Dad" earlier. Kim Thomson - fair play, bit of a thing for her back then. 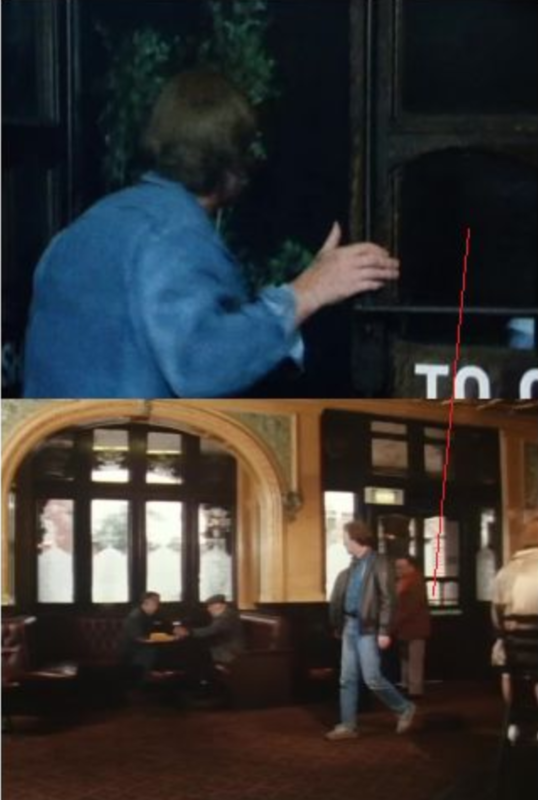 Interesting location fact to some perhaps but "The Crown" pub where Terry goes and waits for Larchy and sees the singer is the same boozer seen at the start of "Rocky Eight And A Half". I remember this one from original broadcast - the scenes at the end where Arthur attempts to keep Terry in his employment by thwarting his chances of a real break are very memorable. We really see how selfish Arthur can be here and the writer clearly gets Arthur's bad side - fair play, Arthur's a right "wrong'un" sometimes, but we still love him! Sadly for me though, the whole 'Marsden Motors' job for Terry just raises more questions about this episode than it provides answers, resolution or outcome. Terry gets the job - so ok, what happens (or happened) next? It is great to see Arthur squirm at the end of it all and of course you feel there is some justice for Terry but my only feeling is that there is no justice for the viewer. Seven days later and Terry is back helping out in "Daley Videos" - so WHAT happened? If there was ever a candidate from all the episodes in series 7 to be "the final Terry episode", this would probably be it for me i.e. 'half a cliffhanger' or in the case of Minder more like "Arfur cliffhanger". Not the most plausable of storylines granted but Minder wasn't about that. As RichB said the banter in this one was brilliant. The best bits being in the Winchester with the shroud - and the reaction of Tick Tack and the others when Arthur tells them Er Indoors had washed and ironed it is as funny as the line itself. Tic Tac: "Hello Arthur, hows tricks?" Arthur: "No idea Tic-Tac, I'm an entrepreneur, not a member of the magic circle..."
Arthur: "No idea Arthur, I'm an entrepreneur, not a member of the magic circle..."
I absolutely love this line and have it stored away just in case anyone ever asks me 'How's tricks?' - I think this line is up there as one of the cleverest bits of dialogue ever in Minder and it is superbly delivered by Billy Connolly with his great accent. Tic Tac is such a great character name too - for me it infers immediately that the guy is clearly into all sorts of shenanigans and deals in all goods various before we even find out anything about him. Anybody been to that location on that street near the airport? Is it actually Hounslow? What a place to live! Crazy! I would like to visit the location. Some nice filming with the planes reflecting in the Jag front window. I can just imagine them lining it up and waiting for the 'Action'! Getting towards the end of the Terry years again, but feels like it needs a change. Looking forward to the Ray years in the next few days. Some truly fresh episodes to come. Anybody been to that location on that street near the airport? Is it actually Hounslow? What a place to live! Crazy! I haven't been to the house but I know what you mean - with the number of planes in and out it must be crazy if you're not used to it. I do know a few folks who live near to airports and they say after a while you don't even realise it as it becomes part and parcel of everyday noise and nothing out of the ordinary. I agree 100% with this. The 'miracle of Hounslow' is ridiculous really but somehow I find it half plausible because it's Minder and Larchlap Riley and his family are so clearly a bunch of crooks anyway. Every time I watch this one I am always impressed by the performance of both Kim Thomson (Sylvie) and Ian Redford (Stevo). I am not too sure about the domestic violence sub-plot and the ridiculousness of Larchy's sheet going together in one story but somehow it seems to work. Domestic violence with Terry playing bodyguard had already been done back from in series 2's 'Not A Bad Lad'. If you compare how Terry has to deal with it in that one versus this one you can really see how the fisticuffs have been toned down. Admittedly it's a different storyline and Terry knows Stevo in this one, but where as series 2 had a ruck in the street, this one simply has Terry dishing out a verbal warning. Gave this a watch in the early hours of this morning and I thoroughly enjoyed, even Billy Connolly, who I normally switch off when I see on TV, was good, wasn't his usual overbearing self and hamming up the Glasgow accent. You know when you have a character called Larchlap Riley that you are going to get good comedy moments and sure enough we did. The story was daft, but that's Minder, expect the unexpected, sit back and enjoy. The other running theme of Terry being the first stop once again for a woman in need, just took us away from the daftness of the Larchlap storyline, but you can see in this series that Arthur and Terrys time together was coming to an end. Terry was just getting to old to carry on as a Minder and I would also say you could see in DWs performaces in this series that his heart wasn't in it. They certainly pulled in some top drawer actors for this final series! A lot of good moments and some great dialogue but this episode felt uneven to me. I liked seeing Terry in knight in shining armor mode again as he helps Sylvie. It's an aspect of the character that diminishes after the first couple years. It demonstrates what a stand up bloke Terry is especially compared to someone like Arthur. I like that Terry threatens Steveo at the end and you know he means it. It's been well established that Arthur is a selfish jerk but I thought what he tried to do to Terry with the car dealer was despicable. Maybe if he hadn't tried to interfere so directly his actions wouldn't be so contemptible. At least it worked out all right for Terry. I didn't care for the whole impression storyline which just seemed ridiculous to me. Not a bad episode but as I said I find it uneven. With a rewrite this could have been a fine exit for Terry from the series. Terry finally getting a real job and starting a new life with Sylvie wouldn't have been a bad way for him to leave. I do know he does leave after this season. I've always wondered if this was meant to be the final episode of series 7. It's a logical way to end the series, even if it wasn't 100% confirmed that Dennis wasn't coming back. Some good stuff here - Billy Connolly's years of stand-up make him a natural (comedians are good like that). Love Arthur's theatrical backache when he's carrying the boxes from Larchlap's van (love his nickname - Larchlap is a kind of panel fencing). Terry looks like he's on the up too as he's got a nice flat - shame this couldn't be his final episode. Any idea why Sheila Steafal's hilariously out-of-tune turn was backed by a huge cheque pinned to the back wall? I love this episode. Perhaps because it was written by a woman, it has a slightly different slant - the battered partner. This brings the very best out in Terry. Shame that she went back to Steveo at the end though. There are some classic Arthur malapropisms: "...the man was an invertebrate gambler" and "...life-long confidante you might be but in my book, you'll be palpable..."
My all-time favourite line EVER though is when he is trying to rally the other creditors with: "What about the great British battles? Battle of Trafalgar? Siege of Maferking? Little Cliffy Richard winning the Eurovision Song Contest?" Lots of sly wit in this episode. Loved it! A lot less bovver than a hover, lol!! Not my favourite episode, but there's always something to like in the George Cole/Dennis Waterman episodes. Arthur's "fallen women" speech makes me laugh. Funny and appalling at the same time - it sums him up perfectly. Another one of my favourite episodes (from series seven), which I can remember watching, in 1989 (when the episode was first shown). There are lots of things, I like about this episode - the miracle storyline, and the reaction of the female Newspaper Reporter (Anwen Rees), to the sheet - thank you very much Mr Daley, for a total waste of time, the scenes at Hounslow, Tick Tack (Billy Connolly), a memorable character, who I wish could have been in more than one episode of Minder, the terrible singing of Sheila Steafel's character, in the Pub, a scene that always makes me laugh, Arthur, once again, showing his devious side, trying to ruin Terry's chances, of finding employment, elsewhere. I remember one scene, in Terry's flat, where Sylvie (Kim Thomson), was watching TV (the end of the ITV News at Ten, I think). I can think of a few other members, of the cast of the BBC Sitcom Brush Strokes, who appeared in episodes of Minder - Gary Waldhorn, Karl Howman, Christopher Ellison and Howard Lew Lewis. I saw Pamela Cundell (who played a mourner, in this episode), a few times, at Dad's Army Days, at Bressingham, Norfolk. "You know where you are with a dog.. It's gonna grow up, have four legs, a tail and bark. But with sprouts you're on a very sticky wicket." I agree Zimbo, I think it's a worthy watch. At the top end in my opinion of episodes in this series. I watched this for the second time today and stand by the comments I posted two years ago. There are some very good moments but overall I find it uneven. I like how it strays away from the typical "You got to help me tonight Terry" "No Arthur, I have a date". Really moved away from that at this point I think and how they make the airplane a running gag for the episode. They really wanted to capture the moments the plane were trying to land for those scenes. It was good.